TheFiftyBest.com held a private tasting with 25 people experiencing 20 blanco tequilas. 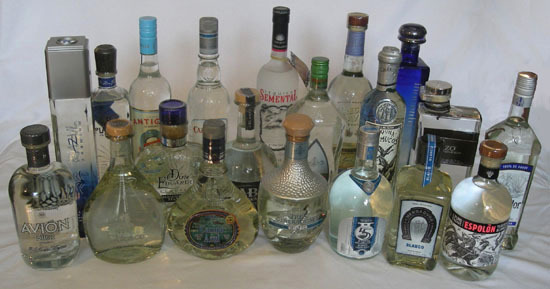 All tequilas were 100% blue agave. The tasters included wine and spirits journalists, bartenders, and tequila aficionados. Tasting Method: The products were served "blindly", with each brand completely unknown to the tasters. The order of service was randomly selected through a lottery system. Each of the tequilas were poured into fresh glasses from new sealed bottles, and served at room temperature, one brand at a time. Ice water on the side and unflavored breadsticks were available to cleanse the palate. There was a resting period between the two flights of blanco tequilas. Food was served during the break. Tasters wrote down their impressions of each product on score sheets. The scoring was done on a 5-point system, with 5 as the best. The totals for the blancos were added up, with the winners determined, based on the scores received. The tasting notes that follow the rankings are a summary of the results, and all replicate commentary has been eliminated while contrasting opinions have been summarized. Ties are listed in alphabetical order. Prices quoted are for 750ml sizes. Prices will vary by state. Double distilled, estate grown Premium Blue Weber Agave. Smooth, spicy, creamy, perfumy, sweet, cinnamon, vanilla, chewy, smoky, hay, floral, lavender, nougat/hazelnut, earthy, long finish. Double distilled, Straight from the still to the bottle. Sweet, spicy, smooth, light, floral, melon, cinnamon, caramel, licorice, oily, peppery, earthy, tangy, prickly. Full bodied, smooth, spicy, floral, smoky, fresh, complex, crisp, vanilla, pineapple, lime, sweet, salty, cotton, pungent, violet. Smooth, tasty, woody, spicy, pepper, sweet, molasses, butterscotch, peanuts, fruity, pineapple, pear, strawberry, eucalyptus, apricot, bitter, caramel aroma. Smooth, warm, balanced, earthy, smoky, floral notes, sweet, spicy, tropical fruit, butterscotch, peaches, banana, vanilla, caramel nose, soft finish. Smooth, peppery, full bodied, balanced, sweet, spicy, clean, tasty, mushroom, crisp, salty, warm finish. Sweet, fruity, citrus, nutty, pineapple, pear, perfume, red licorice, some spice, peppery, woody, sharp, pungent, cedar. Vanilla, caramel, peppery, nutty, almond, smooth, licorice, agave, menthol, floral, clean, salty, slightly smoky, vanilla nose, caramel finish. Floral, dried fruit, peppery, tea, asparagus, eucalyptus, agave, smooth, consistent, well rounded, dry, mild, crisp, clean, floral nose, strong finish. Spicy start, mossy, dry, mineral, sweet, complex, intense, very alcoholic, approachable, crisp, medium-full body, smooth finish. Light, clean, smooth, cinnamon, creamy, buttery, sweet, pear, pineapple, pepper, caramel, lemon, minty, complex, smoky. Classic, smoky, smooth, woody, pepper, spicy, caramel, buttery, honey, ginger, hint of sweetness, well rounded. Peppery, woody, cedar, salty, citrus, fresh, anise, white pepper, cinnamon, vanilla, floral notes, spicy, cloves, mild, fruity, apple, peppermint, nutty, licorice, pungent, soft. Lively, dry, smooth, balanced, sweet, citrus, peppery, assertive, dusty, wet stone, grassy, good for cocktails, long, oily finish. Vanilla, pepper, rosemary, smooth, floral, spicy, balanced, woody, cedar, licorice, tobacco, slightly fruity, caramel, grappa-like, clean, mild, sweet nose. Double distilled. Light, balanced, woody, tangy, spicy, sweet, floral, grassy, flavorful, rounded, short finish. Spicy, apple, cotton candy, woody, vanilla, cinnamon, caramel, pineapple, anise, yeast, burnt, pungent, oak, long finish. Bottled within 30 days after distillation. Earthy, hay, woody, spicy, cloves, peppery, buttery, caramel, agave, smooth, long finish. Spicy, pepper, gummy bears, licorice, hay, nutty, grassy, agave, light. Earthy, woody, mushrooms, nutty, medicinal, grassy, vegetal, sesame oil, licorice, prunes, neutral, pungent. Nutty, spicy, vegetal, asparagus, earthy, medicinal, licorice, pungent, rough, full bodied.